You can enter the Pit of Saron at any time. You don't need to kill this boss. Untrue. The entire group must have completed each dungeon before they can move on to the next. 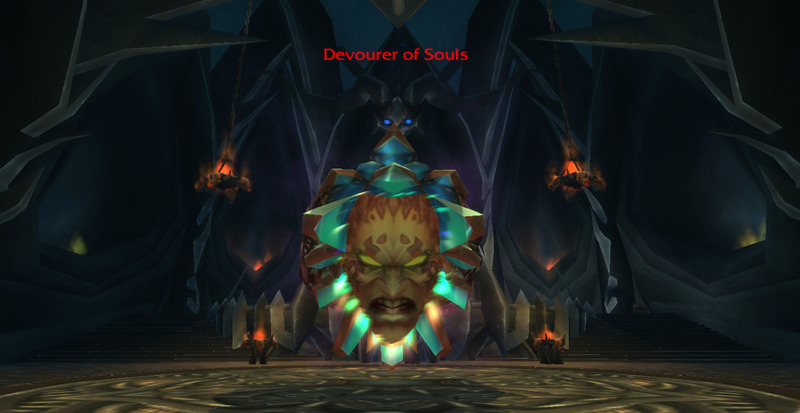 Which means, as of now, one must defeat the Soul Devourer to move on into the Pit of Saron. Seems to look just like the Reliquary of Souls in The Black Temple. I hope his mechanics work like RoS, he was a fun boss. Well I fought this boss (on Normal), he switches between the three essence faces much like the reliquary of souls, when he switches to sorrow, he summons tons of un-targetable adds which do minor damage alone, but he summons roughly 30 of them, and they last for the duration of this essence, then he switches back to anger, does a phantom blast similar to reliquary of souls. He switches to the essence of desire, and shoots a beam similar to C'thun, Mimiron, etc. Which you have to run away from as it circles around. His most dangerous ability is his soul mirror, it will deflect all of the damage he takes to whomever it targets. I also believe he does some sort of aoe you have to run from, although I have only fought him once, so I cannot confirm. If someone can make another post showing it's abilities, that would be amazing. Im sorry forge of souls, and imma let you finish, but black temple had one of the best soul bosses of all time. Of all time! Why was he downrated? This is accurate, but the soul mirror ability doesn't redirect the damage, it just causes the target to take damage based on a % of the damage he takes. You're getting downvoted because no one in their right mind liked that obnoxious interrupt rotation...nor the requirement to run warriors for phase 2. The second boss of The Forge of Souls. Phantom Blast 15 yd range - Inflicts 11700 to 12300 Shadow damage. It's a 2 seconds cast. Phantom Blast (Heroic) Inflicts 17550-18450 shadow damage. It's a 2 seconds cast. Mirrored Soul 100 yd range - The Overseer of Souls mirrors the targets soul! A percentage of damage from the Overseer of Souls is being mirrored with you. It's a 2 sec cast. Well of Souls 40 yd range - The Overseer of Souls leaps towards a target, slamming the ground creating a Well of Souls. Inflicts 2925 to 3075 Shadow damage. It's a instant cast. Well of Souls (Heroic) 40 yd range - 3900 to 4100 Shadow damage. It's a instant cast. Unleashed Souls - The Overseer of Souls is releasing tormented souls periodically. It's a 0.85s cast. Lasts 5 seconds. Wailing Souls - Lets loose Wailing Souls, inflicting 4875 to 5125 Shadow damage to anyone in front of her and knocking them back. This is the initial warning debuff cast on the starting player. Does not do any damage. It's a instant cast. Lasts 4 seconds. Wailing Souls (Heroic) - Inflicts 6825-7175 Shadow damage. It's a instant cast. The Devourer fairly continuously casts Phantom Blast on the main tank if she is not doing anything else. You can intercept Phantom Blast, which I strongly recommend to do. This is her 'main' attack. While Mirrored Soul is active, any damage dealt to the Devourer will be mirrored proportionally with whoever has the debuff. This means you need to stop attacking her or you will die. Another ability of hers is called Unleash Souls. The Devourer will on occasion stop whatever else she is doing and summon a very large number of wraiths. They do not hit very hard but there are a lot of them and they cannot be targeted. Run away if the damage taken winds up being too great. And as her final ability she's having something called Wailing Souls. The Devourer will unleash a wail of souls. She does a 90 degree sweep of the room starting from the position of a random, but debuffed player. She starts wailing around three seconds after casting the debuff, and will wail for 15 seconds. Anyone caught in front of her takes a very high amount of damage ticking every 0.4 seconds. Warrior tanks when the face is doing Phantom Blast you can use shield bash and or spell reflection. Mord'rethar Robes currently dropped while on my Draenei. In other words, ignore the currently listed alliance and horde specific tags that WoWhead is showing under Drops. Got down to this boss, and he was broken...everything looked like Dal on a bad day, all of us were lagging and none of us could engage boss. EDIT:After about half an hour of trying to log back in, got in and trash respawned, but not first boss. Got to second and he went down pretty easy on Heroic. The Mirror will show a red strand connected to the person getting mirrored. When the strand goes away, dps. Run from ghosts. Avoid spots on floor, kinda like the purple stuff in gundrak. That's about it. DKs, refrain from using your Army of the Dead during this fight. The ghouls are not intelligent enough to cease attacking during Mirrored Soul and can quickly drop a party member through their attacks. You mean the DK players ordering the ghouls to attack are not intelligent enough to cease attack. I dont think ghouls attack everything on sight. Rather they are ordered to attack and never controlled again. Just be careful when to stop their attack as well. This goes for hunters too. It would be wise to not send in your pet during this fight, or make sure to recall your pet when you get the debuff quickly. Interesting bug. Killing this guy gave me the Wailing Caverns achievement (Mutanus the Devourer) as well as the actual achievement for Forge of Souls. Nuts! And I'm not kidding either. Make sure you don't end up in the cone of death with that last ability (wailing souls) Especially the healers. Our healer got caught up and died just as she hit the spell, and everyone else ended up wiping when the spell hit except me (being a rogue, I was the only one behind her, so I didn't get hit) Thank God I had enough energy to pull a shadowdance/ambush/ambush and she was almost dead, or I would have wiped too. I ended up finishing her off in a room full of dead partymates. Ghouls from AotD attack everything on sight, the DK does NOT control them in any way. It goes like this: you cast AotD, the ghouls spawn, you move toward and enemy and the ghouls will leap to it, annihilating or getting annihilated. Oh yeah, the taunt too. Anyone know the sound file for this guy.....possibly the MOST awesome voice in the world. FYI, there's a false strategy going around which involves someone telling the healer they aren't allowed to heal during the Mirror Soul phase because "if you cast while he targets you, you'll die a horrible fast death". This strategy is totally BOGUS and needs to be treated as such. The people spouting it have no sources, and both wowhead and MMO champion contradict it. Just to get a clarification, does the mirrored soul only affect one person with the debuff, or does ALL damage need to cease from all parties? The comment above about army of the dead seems to imply that ALL damage needs to cease, not just from the one with the debuff. Hmm, so why does DBM only tell me to stop dps when I have the debuff? Either they are wrong or you are. with mirrored souls, can i dps the mirror target ? have done this boss now with 2 parties on hc, and it was both hard. i wonder what the best tank spot is for this head ? in the middle ? Am I the only one to think of this as a reference Baldur's Gate: Dark Alliance? Between the layout of the room, the portal, and the giant floating head (A Beholder), it just seems too perfect. Edit: Why are my references always downrated? I know that it is more of a direct link to the Reliquary of Souls, but if you've actually played the game, you would notice how similar the layout is. The very first time I beat this boss I /yelled SHUT UP! You dare look upon the host of souls? I SHALL DEVOUR YOU WHOLE! Reminded me more of the lead singer of the band Sweet on the song "Ballroom Blitz". "She thinks SHE's the passionate one!" Yoooooooooouuuuu onllllllllyyyyyy deeeeelaaaaaaaaayyyyy theeeeeee inevitableeeeeeeeeeeeeeee ! Apparently knows how to build up pure energy... and then releases it! On a sidenote, i want to say that these new instances+bosses on heroic are not really hard.. in fact i didnt notice i did heroic till i checked the iLvl of the items dropped.. when comparing that to heroic Black Knight with his last phase.. this is kind of a piece of cake! I don't know if it's just me or what, but the randomization of this guy's loot table seems pretty terrible. I've been farming on normal (closing in on 50 runs, I think), and almost every time it's the caster ring, the dagger, or both. I've never even -seen- the cloak (the thing I'm after), let alone had the chance to be out-rolled on it. Me. He just loves to cry blood (Blood weeper). I didn't see this mentioned anywhere, but Hunters can safely Feign Death to drop the Mirrors Debuff. It goes on to the next phase instead of transferring the debuff to someone else like I feared it would. Something I noticed was that he has the same (last half) death quote as The Prophet Skeram in AQ40. If your healer can't outheal ghoul damage, you've got much bigger issues. Just solo'd this boss on heroic, such an easy boss, im surprised i am the first to comment doing so. Has anyone else noticed the possibility of a Legend of Zelda reference in this boss? In Legend of Zelda: Oracle of the Ages for GBA the boss of the second dungeon was, for the most part, the exact same this as the Devourer of Souls, although a little less evil-looking. Obviously this could be pure coincidence and have nothing to do with Legend of Zelda, but I thought I might as well mention it. 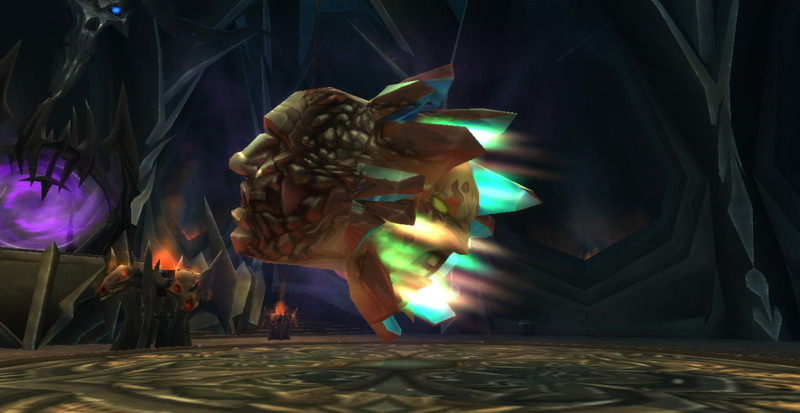 The Devourer casts Phantom Blast constantly on the main tank if he is not performing another ability. This is not 100% accurate. Just got done getting my face owned 3 times with my rogue from this attack. Every time he turned, shot me, then went back to the tank. I was at <50% aggro each time, so I know it wasn't because I was in the lead on that. This guy is creepy as hell. He's especially creepy after you watch this scene (http://www.youtube.com/watch?v=l-XAz8njMiU) from The Princess and the Frog. Yes, I know I just compared WoW to a Disney movie. But still...it's creepy as hell. No 'that's what she said'? YOU DARE, DARE, DARE, DARE, LOOK UPON, LOOK UPON, LOOK UPON, THE HOST OF SOULS? As of now, he/she/it will now cast Mirrored Soul less times in an encounter. Why was I downrated? That was in the last patch notes themselves, it's 100% accurate. Just got Battered Hilt off the boss, first time I have ever seen it off anything but trash. He needs to return in Cataclysm to devour MORE souls. You thought you got rid of this dumb model in Burning Crusade. Right when I was thinking I haven't seen that in awhile I go "Oh my gawd there it is f***". He should emote OM NOM NOM when he kills a player. If anyone noticed the tooltip for Wailing Souls (The IMMA FIRING MY LAZAR! ), it says "In front of her." The swell of souls will not be abated! You only delay the inevitable. I've never tried it on my hunter, because I've only gotten Forge of Souls once with doing several dungeons a day >.>, but my guess is that deterrence also works to stop the Mirrored Soul ability considering it gives a 100% chance to deflect all spells. Viewing this model in 3D (Java in particular) shows a humorous glitch with the top model. One can only wonder what that one is used for, as well as the small ball on the bottom. Okay, just got done with this fight, and was only the third time I had done it. I'm a DK, btw. Warrior asks me to help interrupt on the boss. First time I'd been asked, so okay, I'll toss Mind Freeze and Strangulate when they're up. Strangulate got an Immune, and I was too close to him to see if Immune popped with Mind Freeze, but that I was seeing, it wasn't working either. Am I being mental or did the warrior not have a clue? This boss gets my title of the most annoying boss in the history of WoW. Killed it 37 times, seen my arpen trinket 5 times. 3 times lost to a paladins (! ), 2 times to hunters in greens, who gained not only the trinket but also the achi for hc FoS -.- now that's a bad luck. YOU DARE LOOK UPON THE HOST OF SOULS? I SHALL DEVOUR YOU ALLLLLLL! My GM points out that he sounds like he's saying "You DARE to steal my TOAST? ", a reference to Ren and Stimpy. So my guild always starts the instance by announcing that we've come for the toast. Just remember, he/she will devour your soul! Tip for tanks: on my paladin I found more than 70%+ of the damage I was receiving was from Phantom Blast from the boss! Even if you're the only paladin in the group, I highly recommend switching from Devotion Aura to Shadow Resistance Aura which is 130 shadow resist to each and every member of your group within 40 yards! Obviously, if you're not the only paladin, beg them to switch auras even if it messes up their damage stats. This tip combined with making sure dps avoided purple circles (I kited the boss a little each time past the circle which spawns below it to help out melee dps) and ALL stopped dps'ing boss when someone had a Mirrored Soul link (wavy red beam from boss) ensured that fight was very straightfoward bordering on tank and spank. Other tips: the adds can be totally ignored and are basically a healer problem, unless it stops them casting for some reason due to pushback, in which case try to get a shield/HoP on the healer. The frikkin slow moving laser beam is such an obvious and easily avoided mechanic that it is barely worth mentioning. Would Dispersion work for priests? It was a slow night, so I decided to solo him on my 85 bear in blue 333 gear. The summoned souls can be outrun if you go up the stairs toward the portal (good time to throw some healing on yourself too! ); the beams are slow-moving and can be easily dodged (once again, healing time!). Make sure not to attack him while Mirrored Soul is up, and the rest is fairly straightforward hitting him in the face(s) until he dies. Also don't make the same mistake I did and run away from the souls the way you originally came, or he'll despawn on you. Second boss in FOS can cause some problems. Tank should have two macros ready: /say STOP ATACKIN>> MIRROR and /say RUN BEHIND BOSS>> LAZER. When boss is casting Mirrored Soul, everyone must STOP dps: his mirror transfers dmg onto random player. That's when most parties get wiped, because dps continues to attack boss; so it is tank responsibility to use macro spam (/say STOP ATACKIN>> MIRROR). When boss is castin Wailing Souls, everyone should go into boss' face, walk thorugh him and stand behind him. That's when most ranged dps die: by standing on max range and being unable to RUN behind boss. That's why everyone, including healer and ranged, should stay close to tank during the fight. Tank, on the other hand, must use macro spam again and again (/say RUN BEHIND BOSS>> LAZER). It is not dps race, healer won't run out of mana. All other things this boss does are not worth mentioning. I've done him lots of times as a tank using this tactic (spamming both macros accordingly). Spamming macro is vital; not everyone gets the message first time. Just stop dpsing on mirror, and stay close to tank to run behind boss, when lazer pops up. Tank use macro spam. Enjoy! my post got deleted? i left my tactics on that boss but post is gone? Soloable in heroic at 85 but kind of tough without a decent heal. For hunters, since our only heal comes from Chimera Shot and it's not much, you have to be VERY careful when he uses Unleashed Souls, they will kill you if you stand there and try to eat the hits, you'll probably end up using Deterrence. I tried to eat the hits, used Chimera Shot when I got too low but I still had to blow Deterrence. Really as long as you can make it through the Unleashed Souls, the fight is easy, just stop attacking when Mirrored Soul is up (Make sure your pet does too, set your pet to Passive before the fight so he won't go back to attacking when you use Follow), avoid the Well of Souls and Wailing Souls. Soloed on heroic as a 85 feral druid with tankish talents and 352 blue pvp gear. While the fight is difficult, once you know how it works fully it's actually not as difficult as it first seems. Start in bear form and dps the boss. I tried to keep up demoralizing roar whenever i could and popped barkskin every now and then. Everytime your skullbash is ready and he's casting phantom blast interrupt it. The thing hits like a truck and it's what will kill you. When he puts on his annoying mirror soul ability spin your character around 180 degrees to stop yourself attacking. This is important because the ability lasts a while and during it he'll cast phantom blast which you need to spin around and interrupt with skullbash. Once it's gone you can go right back to dpsing. If he starts to unleash souls pop into cat form and speed up the stairs and hide behind the portal. Try to keep him line of sighted with the portal until the adds disappear. Once they have try to get him back downstairs again so you can repeat the process. If he casts wailing souls run behind him as soon as possible. Use the time he's screaming at the wall to heal up. Generally whenever you have a chance that your away from the boss and not exchanging blows with him try to get in some rejuv and lifebloom spells to get your health up. I hope this helps some others who try to solo him. This was soloable by an 85 prot warrior (~346 gear) until the unnecessary Spell Reflection cooldown increase. Probably better off trying to burn him down as fury or possibly arms now. If you can survive until Wailing Souls, you'll most likely win as you get a free burn period with zero incoming damage. Trying to solo this guy puzzled me at first but then it down on me the right approach. I killed him entirely in cat form. He moves very slowly so whatever ability he casts just run away. His only real attack is shadow bolt, which you can interrupt but don't need too. When he spawns the adds just run up one side of the stairs...wait a few seconds so they all go to that side of the room...then run down the other side. They move slowly too and will despawn after about 20 seconds. Use the time when you are waiting at the top by the portal to heal. You may have to repeat the cycle more than once. What will kill you on this fight is if you try to burst him down or tank n' spank. Just whittle him down and he dies easy. Evidently all the old lvl 80 bosses offer 7 honor points now. Very easy solo on 85 hunter (t11s10 gear). Burn, FD beam, kite adds, burn. Just killed him as a fresh lv 85 Fury Warrior solo tonight. Was a rush! Had to change up gear a little and go from 83-85 before I could manage him but woo ;). Soloed him as Assassination Rogue on crappy pvp gear, it's a bit difficult but it can be done. Started hitting him hard, used Vendetta, CoS'd through the first Mirrored Soul (cast only AFTER he debuffs you), kept Recuperate on at all times, and sprint-kited him whenever i was low on health. Interrupts are a must, of course. Soulyent green is SOULS, people! Solo'd as 376 Enh Sham in 43 seconds (according to Recount). Totems / Wolves / Bloodlust / Blood Fury (racial). Just stood in the middle of the room and wailed on him until he died. Popped Stoneclaw totem (glyphed) for the shield. Didn't really need to heal because of the heal from wolves. Interrupted all spells (wind shear specced). I failed miserably at killing him with my feral druid (iLevel 352). However, I managed finally with my marginally better-geared disc priest (iLevel 355). Permanent DoTs (except when Mirror of Souls was up) plus a bit of dps when I felt it was safe; plus a lot of healing and a lot of running up & down stairs.. Very easy solo on heroic as a boomkin, just apply dots and kite him around. Heal if need be, and his ghost adds are kiteable as well. I was looking for this dungeon entrance for something to do. to find the entrance, go to the ICC Raid entrance. face the entrance, fly up and to the right. On the second level above the ICC entrance, there is a cave like entrance, with a skull on it. this is where the entrance to the three dungeons are. The face that is active when the boss is killed will determine the voice saying the death quote, but the words of the quote itself will remain the same. If that made absolutely no sense... Say the boss is in the middle of using Wailing Souls when it dies. During the Wailing Souls, the female face is active and the death quote will be said in a female voice. Edit: In addition to this, it seems there are some potentially unused sound files for the boss. There are female versions of the the first male faces, for example. Check them out! We can only imagine the faces that the female voice actor was making while recording these. I'm a Retribution Paladin. I'm built for dealing out damage. I can't even heal unless I'm dealing out damage. HOW AM I MEANT TO BEAT THIS GUY? This is strange, I encountered something very different when I fought the Devourer of Souls just now (Saturday, January 17, aprox 4 PM server time, it may have something to do with it). I went to fight it and noticed that the music seemed really... unfitting. It was like a rock version of some LK song that played only in the hallway to the Devourer of Souls and in the room with the boss. The boss was also very strange, rather than just the red aura that surrounds the face, it was a series of different colors, kind of like the multicolored lights you'd put on a tree/house during Christmas. I wish I got a screenshot of the boss before I killed it, but I thought for sure someone else might have seen this happen before. D: I can't seem to find anything on Google about it, but I'm going to see if I can get to him again with the same results for the sake of me not looking like a big troll on the internet. Edit: I forgot to mention that I was on Normal Difficulty when this happened. Also, the song seems to play when Bronjahm is dead, not necessarily when you are in the hallway to the Devourer of Souls/his room. I am writing this as I test it out, and the Devourer's aura is still multicolor. I'll post a screenshot once I finish editing this post. Edit pt 2: I learned that the music I was hearing was the song that plays when you fight Bronjahm. I thought it might have been related, but I guess not. *shrugs* I also posted the screenshots on my blog, just in case someone would like to see them. The front view is here and the side view is here. This NPC can be found in The Forge of Souls. The Devourer of Souls is the second and last boss in The Forge of Souls. It also guards the Crucible of Souls, needed to temper Quel'Delar. It is related to the achievement Three Faced. This fight may be very confusing for the average player. The Devourer of Souls frequently jumps to a random player, creating a Well of Souls that deals huge damage to anyone standing in it. Move out of the purple circles! The well lasts for 15 seconds. "Devourer of Souls begins to cast Mirrored Soul! ": Occasionally the Devourer of Souls debuffs a player, mirroring damage taken to him. Players must stop DPSing as long as the (de)buff on the boss is active. "Devourer of Souls begins to Unleash Souls! ": Here he summons a high number of unattackable souls. The party must outlast these and continue fighting the boss. Run if the damage starts getting high. "Devourer of Souls begins to cast Wailing Souls! ": The Devourer of Souls channels a kind of laser that sweeps the room in a clockwise/counter-clockwise direction. Avoid crossing the gleaming beam for it will kill you rapidly. Phantom Blast - Inflicts 11,700 to 12,300 Shadow damage. Mirrored Soul - The Devourer of Souls mirrors the targets soul! A percentage of damage from the Devourer of Souls is being mirrored with you. Well of Souls - The Devourer of Souls leaps towards a target, slamming the ground creating a Well of Souls. Well of Souls - Inflicts 2,925 to 3,075 Shadow damage every second. Unleashed Souls - The Devourer of Souls is releasing tormented souls periodically. Wailing Souls - Lets loose Wailing Souls, inflicting 4,875 to 5,125 Shadow damage every 0.4 seconds to anyone infront of it. - Inflicts 17,550 to 18,450 Shadow damage. - Inflicts 3,900 to 4,100 Shadow damage every second. - Lets loose Wailing Souls, inflicting 4,875 to 5,125 Shadow damage every 0.4 seconds to anyone infront of it. Devourer of Souls yells: Stare into the abyss and see your end. Devourer of Souls yells: SUFFERING! ANGUISH! CHAOS! RISE AND FEED! Devourer of Souls yells: The swell of souls will not be abated! You only delay the inevitable. Devourer of Souls yells: You dare look upon the host of souls? I SHALL DEVOUR YOU WHOLE! Mirrored Soul – The Devourer of Souls mirrors a player's soul! A percentage of damage taken by the Devourer of Souls is being mirrored with the targeted player. Phantom Blast – The Devourer of Souls inflicts 74 Shadow damage to a player. Well of Souls – The Devourer of Souls leaps towards a random player, slamming the ground and creating a Well of Souls. The well persists for the remainder of the fight and inflicts Shadow damage to all players within 4 yards every second. Unleashed Souls – The Devourer of Souls unleashes a torrent of souls for 5 sec. The Unleashed Souls cannot be attacked and pursue random players for 15 sec. Wailing Souls – The Devourer of Souls lets loose Wailing Souls for 4 sec., inflicting 31 Shadow damage to anyone infront of her and knocking them back.